Anders Aslund spoke with RBTH about Russia’s WTO accession, the future of the economy and why the country needs pension reform. It is almost certain that on Dec. 16, when the WTO Ministerial Conference takes place in Geneva, Switzerland, Russia will be at long last asked to join the global trade club. Alexander Gasyuk, the Washington, DC correspondent for Rossiyskaya Gazeta and contributor to Russia Beyond the Headlines, recently sat down with Anders Aslund of the Peterson Institute for International Economics to discuss the long process of Russia’s WTO accession and what the future holds for the Russian economy. Russia Beyond the Headlines: You repeatedly argued that Russia should become a member of the WTO. Why, in your opinion, did it take Russia so long to join? Anders Aslund: If you look at history, in June 1993 Russia submitted its application and essentially didn’t do very much until 2000. There were people like Yegor Gaidar, Yevgeny Yasin, Boris Fedorov and others who understood the importance and were in favor of the WTO. But none of them were in a position to make serious policy decisions. A change came in 2000 – German Gref came in, a man who understood the real importance of the WTO; China joined the group that year. The major factor was, of course, Vladimir Putin, who from 2000 to 2003 was very interested in joining the WTO. He set a target to join by 2003, and when it didn’t happen, Mr. Putin lost interest. Then President Dmitry Medvedev came in and was also really interested in the WTO. But war with Georgia in a way blocked this process, and after that Russia decided to go ahead with the Customs Union, which delayed joining. Beginning in June 2010 with meetings between President Medvedev and President Obama, the decision was reached that the time had come for Russia to join the WTO. In the end, all that was needed was political commitment on the highest level. RBTH: But during this long accession process, Moscow became really unhappy with more and more demands coming in. Isn’t that right? A.A.: There are many factors here, but generally speaking it is much more difficult for a large country to join the WTO than for a small country. So it was indeed rather irritating for the Russian establishment to see countries like Kyrgyzstan, Moldova, Georgia and others being admitted into the WTO without anybody caring while Russia was being stopped at each and every turn. The problems came about simply because in the WTO, the more important you are in global trade, the more demands member states want to impose on you. For instance, nobody is interested in what Kyrgyzstan is doing in its trade relations. On the other hand, Russia has a big impact. Once again, the more important your economy is, the more demands will be put on you. And this understandably is irritating because major countries expect to be treated with respect rather than by being demanded to concede on more and more issues. RBTH: Having spent 18 years on negotiations to join the WTO, do you think Moscow managed to achieve the terms and conditions it wanted for joining? A.A.: Probably, but I also have to say that things have changed. The major lobbyists in Russia against joining the WTO were the automotive and airplane industries. And these industries totally changed – Russia’s largest auto manufacturer, AvtoVAZ, now operates in joint ventures with General Motors and Renault. The car industry in Russia over the last 18 years has completely changed, and now it consists mostly of foreign companies that want to produce cars in Russia. Meanwhile, the civil aircraft industry has almost disappeared. Conditions have also changed in the software and high-tech sectors. Today Russia has a strong advanced software industry, which is concerned with properly abiding by intellectual property law standards in line with WTO requirements. RBTH: Russia is steadily moving forward with its regional integration plans. For instance, the Customs Union has already been set up. Now Mr. Putin talks about a Eurasian Union. What do you think would be the fundamental economic reasoning for a Eurasian Union if Russia decided to go ahead with the idea? A.A.: The fundamental problem with a Eurasian Union is that Russia would dominate, like in the CIS. There would not be a balance like that which existed, for instance, between German and France in the early stages of the EU. The former Soviet republics always ask the question, “How much will they take from us?” This is not a good relationship. RBTH: Russia’s leadership has been very focused lately on modernizing the economy. Do you see any progress being made? A.A.: I think it depends very much on oil prices and economic growth rates. J.P. Morgan Chase analysts predict that [Russia’s economy] will grow by 3.5 percent. I tend to think that it will be between 3.5 and 4 percent, but nevertheless, there is the sense that Russia should grow faster. The WTO is very important in pushing to modernize Russia’s economy; in combination with a strong higher education system, it indeed could be a tipping point. RBTH: Still, Russia’s economy is heavily dependent on the export of hydrocarbons. The International Energy Agency’s most recent World Energy Outlook report suggests that Moscow’s revenues from oil and gas sales will almost double by 2035 from $255 billion in 2010 to $420 billion in 2035. Does such a forecast make the Kremlin’s modernization agenda more realistic? A.A.: It means that it will be more difficult to modernize. Russia now earns 19 percent of its GDP through oil and gas exports, which is expected to go down to 13 percent by 2020 simply because oil and gas production in real terms is not increasing much. Oil and natural gas production is close to stagnation while other sectors are growing. RBTH: What will Vladimir Putin’s expected return to the Kremlin mean for Russia’s economy? A.A.: Mr. Putin is quite cautious regarding fiscal policy, but he clearly is not very interested in structural reforms. His return means to me a more realistic and responsible attitude in foreign economic relations. Big foreign investors will probably have more interest in doing business in Russia with Mr. Putin as president. ExxonMobil’s deal with Rosneft illustrates this point, but for smaller businesses that are very cautious about the investment climate, it may be different. RBTH: Former Russian finance minister Alexei Kudrin publicly warned the Russian government against increasing social and defense spending, as well as mentioned certain risks for financial sustainability in the budget. How do you interpret that? A.A.: Generally, I think it is very good that Russia has a clear and public forum for economic discussion. In this sense, pension reform is one of the biggest issues. Today Russia’s pension expenditures are 9 percent of GDP. This is more than in European countries and the U.S., where it tends to be about 6 percent of GDP and 5 percent of GDP, respectively. Ukraine spends 18 percent of GDP on pensions, but this is financial madness. Russia needs pension reform, and it would be better to handle it sooner rather than later. Anders Aslund is a senior fellow at the Peterson Institute for International Economics in Washington, DC. From 1984-1987, he was a Swedish diplomat in Moscow and from 1991-1994 he was an economic adviser to the government of the Russian Federation. 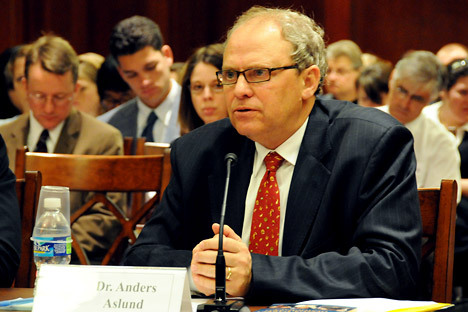 Today, Aslund is considered one of the most authoritative experts in the U.S. on the Russian economy.